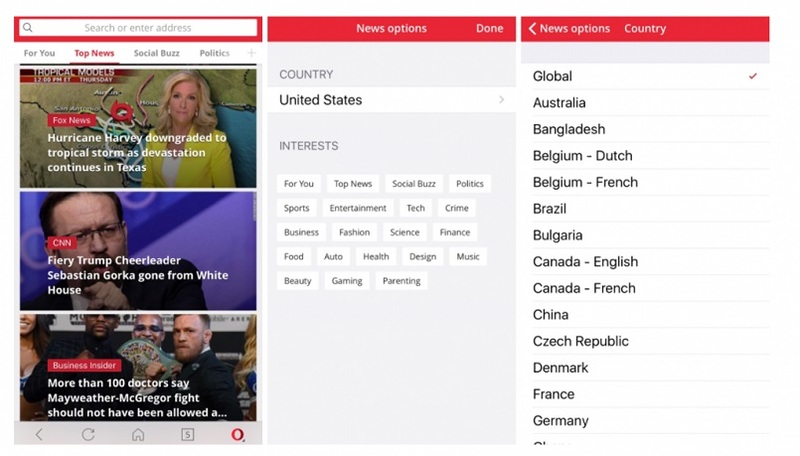 Opera Software has rolled out a new version of its mobile browser Opera Mini for iOS with new features and redesigned UI. The new version features a news feed on its start page which is powered by Artificial Intelligence (AI). The AI powered news feed is based on the GBDT (gradient boosting decision trees), a machine learning algorithm and deep neural network (DNN) learning. Opera claims this will help users to get the news four times faster than the previous version. Also, no setup or customization is required to set up this more personalized start page. The news engine analyses user’s interest through the deep learning model that understands what users are engaged with. The more the users engage on the newsfeed, the more sorted the content will become for the users within the ‘For You’ section. The app will allow users to customise the news feed with news sources by setting location and categories as per their choice. In order to set up this, users need to swipe to the left on the top of the start page and click the plus button in the top-right corner. Additionally, the Opera Mini for iOS comes with a completely redesigned UI. The address and search bar color has been changed to Opera red. The search bar has also gotten smarter with the option to customize the search engine. Moreover, it will now also allow you to scan QR codes as well. The news feed feature is rolling out to select countries as of now, including India. In India, it is available for English, Gujarati, Hindi, and Tamil users. Apart from India, the feature is also available in countries such as Indonesia, South Africa, Tanzania, and the United States. Download the latest version of Opera Mini for iOS from App Store.